Summer Eats Series Part 8: 4th of July Eats. Get Fruity! 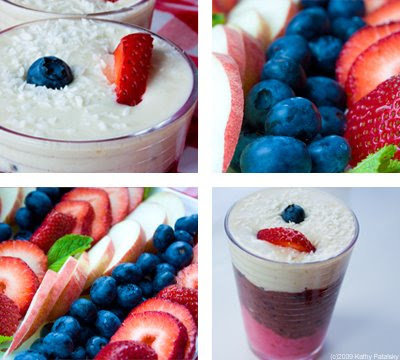 Red, White and Blue Eats: 4th of July. 1. Red, White and Blueberry Smoothie: Raspberries, fresh strawberries, acai juice, soy milk, fresh blueberries, coconut banana cream on top. Vegan. *Healthier than a traditional frozen shake, or artificially colored frozen red, white and blue treat. 2. Fresh Fruit Flag Plate: Fresh cut white peaches, strawberries and blueberries. A simple fruit plate is always a winner! *Healthier than most platter snack plates. 100% fruit means 100% healthy. And delicious. Use organic fruit or was very well. One more to go in the Summer Eats, Healthy Makeover Series! Next up, Readers Choice post! Voting closes on July 6th, 12 AM!